For those new to our website, we’d like to acquaint you with some background. The Maine Brain Aneurysm Awareness Committee (MBAAC) was formed in 2009 and is a group of committed volunteers that seek to remember and honor our loved ones lost to or having survived a brain aneurysm. Our mission is to provide support to the brain aneurysm community, raise public awareness regarding early detection and treatment and to help fund research. Our ultimate goal is to help save lives and improve the quality of their lives! 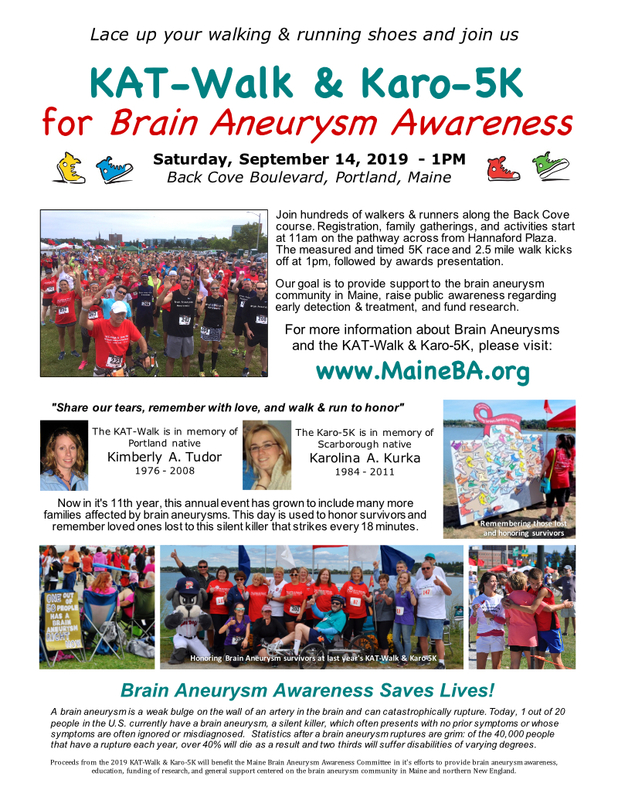 The MBAAC organizes the highly successful annual KAT-Walk and Karo-5K for Brain Aneurysm Awareness, held in September on Portland’s Back Cove. We helped form and provide logistical support to the Maine Brain Aneurysm Support Group that meets monthly at MMC. We have conducted many Dance and Dine for Awareness events and participated in a myriad of health related conferences and resource fairs. Since it’s inception, the MBAAC has raised and donated over $120,000 to help fund research, education and awareness. Dave & Heidi McCausland talked with TV Host – Derry Rundlett about Brain Aneurysms and the importance of knowing the signs and symptoms. The Maine Brain Aneurysm Support Group offers information, education, encouragement and understanding to those affected by brain aneurysms. We have a very active Facebook presence! Stay up to date on what we're doing for Brain Aneurysm Awareness. Enjoy looking through some photos of previous events. We have grown so much over the years and it's all due to the generous support of individuals and companies who are helping us raise awareness. We are a group of committed volunteers that seek to remember and honor our loved ones lost to or having survived a brain aneurysm. Our goal is to provide support to the brain aneurysm community in Maine and raise public awareness regarding early detection and treatment of brain aneurysms.